Agriculture Minister Begum Matia Chowdhury yesterday said the government will distribute Aus paddy seed and chemical fertilizers worth Taka 40 crore among the 2.37 lakh small and marginal farmers across the country free of cost to increase the production of the crop, reports BSS. "Seed and fertilizers worth Taka 32,33,53,170 will be distributed for Ufshi Aus among the farmers of 64 districts while seed and fertilizers of Taka 29,30,075 will be distributed for Nerika Aus in 40 districts," she told journalists at a press briefing at her ministry's meeting room at secretariat here. The minister said a total of Taka 39,62,83,245 will be spent for distributing seed and fertilizers and because of this incentive, Aus paddy will be cultivated on about 2,37,182 bighas of land. She said five kilograms (kg) of seed, 20 kg urea, 10 kg DAP and 10 kg MOP fertilizer will be given for the cultivation of Ufshi Aus on one bigha land while 5 kg seed, 20 kg urea, 10 kg DAP and 10 kg MOP fertilizer will be given for cultivation of Nerika Aus rice on one bigha land. Besides, Taka 500 for irrigation and Taka 500 for cleaning the crop field will also be distributed among the farmers, she added. Matia said the incentive money will be distributed in late March while the government's concerned committees will finalize the lists of beneficiary farmers. She said additional 5 lahk tons of Aus rice was produced this year while the target of producing Boro rice is 1.90 crore tons this year. 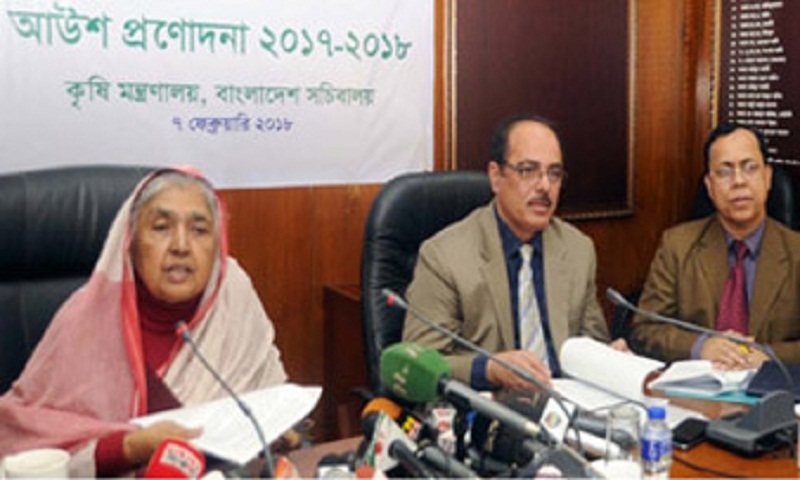 Senior Secretary of the ministry Mohammad Moin Uddin Abdullha was present in the press conference.